Settings will allow you to customize your Pod account to best suit your needs. You can access the Settings by clicking on the Options Button in the top-right of the Map Screen and clicking settings. By clicking on the User Profile button you’ll be able to update the name, email address and phone number associated with your Pod account. 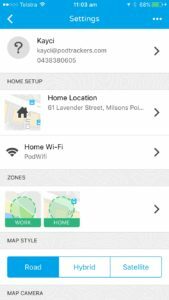 Home Setup allows you to adjust your Home Location address and your Home Wi-Fi network. 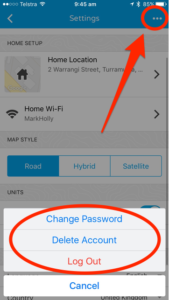 Correctly setting up you Home Location address and maintaining the correct address is very important. 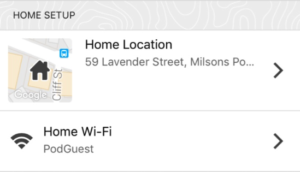 The Home Icon should be centered over the roof of your home on the map. This is where your pet icon will show when the Pod is located within range of your Home Wi-Fi network. If the Home Icon is not on the roof of your home, you may find your pet is not accurately located when at home. Setting up your Home Wi-Fi network is important for a few reasons. The main reason is to improve battery life. The other reason is to improve location accuracy when your pet is at home or indoors. GPS cannot penetrate solid objects (inside your home, a shed or a garage) so Wi-Fi provides a fallback technology to help locate your pet in these scenarios. Zones can be managed through this settings screen as well as within your pet page. Once you click into the zones button you can resize, move or rename your various zones. Please note – you must select which zones are active for each pet within the pet screen. In the Units section, you can specify which units of measurement you would like the Pod and app to display. For Distance you can toggle between miles and kilometers, and for Weight you can toggle between pounds and kilograms. The Internationalization section allows you to set and update your default language and the country where you’re using your Pod. The Sounds section allows you to select your notification sounds. You can choose from the default Pod sounds (dog bark, cat meow) or you can select your phone’s settings which you can manage in your phone’s settings. You can link your app to your Facebook account if you want to share your pet’s Adventures with your community! You can also sign in and out of the app with one click.